Without doubt one of the most serious problems with Twitter is the high level of stalker-like behaviour it harbours. I looked in my Celebrity Worship article at how manipulative, relentless and underhanded some people can get when it comes to demanding attention from their idols, but you don’t need to be a celebrity to fall victim to an online stalker. Firstly, stalking is not merely keeping an eye on what someone posts on the public Web. That’s just reading what they publish, and it has nothing to do with stalking. Stalking involves interaction. Per se, it’s a combination of abject selfishness and delusion. Stalkers are unable to grasp that the relationships they think they’re forming, or think they’re in, don’t exist, and never will. And because they’re so phenomenally selfish, stalkers don’t respect anyone’s wishes but their own. Stalkers invade people’s lives with an entirely unwanted brand of attention. Their highly manipulative, possessive and controlling behaviour makes their attention even more unwanted, and that in turn makes them more manipulative, possessive and controlling still. It’s a vicious cycle. Unlike ordinary people, stalkers can’t take a hint, and at the extreme end of the scale, even in the face of universal discouragement they’re so committed to their delusions that they have to be forcibly restrained. What makes stalking so prevalent on social websites is that often, the early stages of a stalker’s campaign can inadvertently be encouraged. Because there’s always a feeling of distance between the two parties, people can be more friendly, or perhaps even flirty, than they would be face to face. Also, on the Internet, the signals which in the offline world warn of impending danger are much harder to detect until it’s too late. All of this is exacerbated further by the Social Web’s self-promo tools: the Follow and Favourite functions, etc. People are most likely using these tools to increase their own online status, but to a stalker, a Follow and a few Favourites can take on a whole different meaning. Internet stalking bears all the hallmarks of offline stalking. Stalkers online refuse to accept that their constant pestering is unwanted, just as they do in the ‘real world’. They want an explanation as to why they’re getting the cold shoulder, but when they get an explanation they can’t accept it, so they want another, better explanation… And so it goes on. It’s the classic image of stalking, set into a virtual environment. There’s a considerable amount of crossover between online stalking and trolling. Many trolls exhibit behaviours common to stalkers – their unwanted pestering being the centrepiece of the common ground. The difference, mainly, is that trolls are motivated to randomly annoy and get a reaction (like naughty children), whereas stalkers are motivated to possess and control specifically selected people. Twitter is an Internet stalkers’ paradise. Why so? Primarily, because the site is un-moderated, and users are able to post in obscurity, with the option to retract their messages. Stalkers typically fear the public gaze and are intimidated by the thought of their interactions being preserved with high public visibility. On a traditional forum, the system discourages stalking because posts are routinely seen by all the site’s members and visitors. Plus, there’s often little or no means for users to edit or delete their posts, and there are moderators policing the content, which means that any unacceptable behaviour is dealt with at square one. Everything’s out in the open and generally indelible, and the classic stalker will hate that. But on Twitter, the environment is very different. If a stalker sets up a new account and doesn’t have any followers, he or she can message a target specifically and personally without anyone else inherently seeing that message. The message is technically public, but because of Twitter’s design, no one but the recipient of the Tweet is going to know it’s there. True, if the recipient replies or retweets the message, attention can be drawn to it, but on Twitter, users retain a perpetual option to delete their messages, which enables the stalker to remove the ‘audit trail’ of what he/she has said. If someone’s predisposed to behaving badly, this system brings out the worst in them. Worse still, Twitter has no active moderators, and even if an account is reported and suspended, a user can simply replace the account within minutes. It’s hard to think how a website could be made more conducive to stalking. Blocking, Ignoring, and a range of other semantically-grand features have been presented as a solution to unwanted contact on socially-driven sites. Twitter’s version is the Block button. Does it work? Well, it can, but for a really determined stalker it’s so easy to circumvent as to be almost useless. The whole issue with stalkers is that they won’t take no for an answer. They therefore don’t recognise blocking as a legitimate form of arbitration. What happens is that the stalker begins to set up new accounts in order to evade the block, and if that doesn’t yield the desired result, he/she may even seek to involve another individual (perhaps a carefully chosen friend or colleague of the victim) in the debacle. Angry stalkers can also resort to publishing retaliatory posts, often built around lies, and designed to avenge their ostracism. Block functions can therefore escalate or exacerbate situations which could be better contained through communication. This is not to say that victims of stalking should have to communicate with stalkers – just that the terminology used on these ‘Block’ functions can mislead people into thinking that they’re a failsafe way to address obsessive and delusional behaviour online. ‘Block’ functions are okay for use with random trolls who don’t care who they annoy. But with stalkers, who have an obsession with one specific person, ‘Block’ functions can fan the flames. If you click the link a lot, over time, and read a large number of the tweets, you’ll get a great insight into human delusion, and how prevalent the stalking mentality is on Twitter. They all know exactly why they’re blocked. They just can’t accept it and don’t respect the fact that their annoying and sometimes evidently abusive contact could possibly be unwanted. I’m not saying everyone who comes up in that search is a stalker – just that people don’t respect the Block button, and that using the function before explaining that you don’t want further contact is unlikely to shut a stalker up. DO INTERNET STALKERS REALLY BELIEVE THEY’RE BLAMELESS AND NICE? In truth, Internet stalkers know they’re in the wrong. If you look at their behaviour, it’s clearly indicative of a character who knows he/she is behaving in an unacceptable manner. Common traits include calculated deletion of public messages, a relentless quest to establish private contact, and frequent positive self-assessments. If someone is routinely deleting their public messages, there’s obviously a reason for that. And if no one’s actually telling them to do it, then it’s clear that they’re aware there’s some sort of problem with what they’re saying. The quest to establish private contact is an extension of the above. The point of social networking sites is that they’re public. Only if you know what you want to say will be questionable in the eyes of the public will you try to gain access to Direct/Private Messaging systems or an email address for simple online chat. As for the positive self-assessments – balanced characters don’t need to make them, but those who know they’re behaving badly have to keep repeating them as reassurance. It’s the “I’m a nice guy!” thing. Nice guys don’t go around saying: “I’m a nice guy!” They don’t need to do it, they’d be too modest to do it, and frankly they wouldn’t even think to do it. Only those whose good nature is in question are going to feel the need to make remarks like: “I’m a nice guy!”. 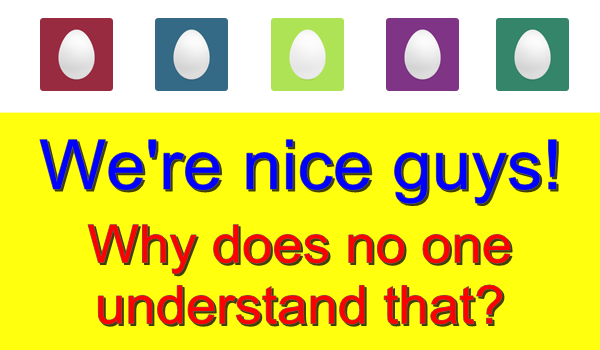 You can guarantee that if someone has the phrase “Nice guy” in his Twitter bio, he’ll be one to avoid. The reason he feels the need to stress his good nature so prominently is that people have questioned it on a regular basis, and of course, there’s no smoke without fire. Don’t use Social Web tools indiscriminately. Be selective about the people you Follow, Favourite, Retweet or Reply to. Stalkers will read hidden meaning into anything, so even if you’ve Followed and Favourited them as a flippant action to inflate your Klout, they can be hugely encouraged by your actions. Look carefully at people’s accounts before acknowledging them in any way. If there’s any evidence of erratic/contradictory behaviour, or any negative/creepy stuff in their bio, steer well clear. Think carefully before accepting ‘acts of kindness’ from people you don’t know much about. No one does anything without some sort of motivation, so if someone’s offering to do you serious favours, they’re bound to be expecting some sort of payback. If you can’t work out what that payback could be, they may be trying to engineer a relationship – their aim being to use the favour for emotional blackmail. Don’t accept any serious favours without properly establishing what the offering party expects in return. If you’re in any doubt whatsoever and/or feel you’d be getting something for nothing, just decline the offer. Nothing in life is really free. Don’t flirt with anyone you don’t know anything about – ever. This should go without saying, but don’t give any personal details to anyone on Twitter. Think twice before publicising when you’re going out, pay particular attention to any geographical information you may be accidentally leaking, and be very cautious about publishing photos which reveal personal/geographical information. Twitter is in any case a haven for fakers, and personal pictures have a habit of being stolen and used for nefarious purposes, regardless of whether anyone wants to stalk you. If someone is starting to creep you out, tell them you’re uncomfortable with their contact, and be firm and direct. Stalkers can interpret diplomatic language as game-playing – a kind of “no that really means yes”, so don’t dress up any of your feelings. If someone’s creeping you out – tell them they’re creeping you out. Don’t worry about being sharp or rude. Stalkers are uncompromisingly selfish and won’t care about your feelings, so you certainly don’t need to harbour any undue concern for theirs. If you feel like you’re being stalked, say you feel like you’re being stalked. If the pest starts to question what they’ve done wrong, don’t try going into any detail because the conversation will never end. Simply and clearly say you’re asserting your right to be left alone, and you do not want them to contact you again. If they persist after that, hit the Block button. If the stalker circumvents the block, block their new account and report them. You may need to block a stalker a number of times, but most will eventually tire of setting up new accounts only for you to click a single button and render each one useless. After you’ve said you want no further contact, don’t communicate with the stalker again. Just ignore them and keep blocking. One tactic that looks to have had considerable success in deterring stalkers is that of screen-shotting their tweets (and provisionally, other messages) and posting them on your own Twitter so the stalker can’t delete them. This takes away the stalker’s feeling of control and is highly likely to make them think before they send further messages. However, be careful not to dox a stalker when doing this. Doxing is revealing private information about a person, and it’s a breach of Twitter’s terms, as well as the terms of almost every other site. It can even land you in legal bother. So don’t publish anything that reveals non-public information about a stalker – such as their phone number, email address, etc. The idea is to preserve and draw attention to their actual messages, so they can’t simply withdraw them. Just the knowledge that you’re capturing evidence and are prepared to publish it should scare them. But go through the “IF YOU CONTACT ME EVER AGAIN I WILL TAKE ACTION!” warning stage before doing this. Don’t say what action, by the way. The unknown is the greatest fear of all. The screen-shot tactic is best employed when the stalker has blatantly failed to take no for an answer. If the stalker makes any threats, tell Twitter, make it public that you’re being threatened, and stress that you’re going to contact the police. Don’t directly tweet the stalker – put the information in a general tweet for all your followers to see. Don’t worry, the stalker won’t miss the message, and you should get some support from your followers if you let them know what’s going on. Internet stalkers are cowards at heart – that’s just an extension of their overwhelming selfishness. They won’t want to face the prospect of wider public derision and a potential conviction for threatening behaviour. Don’t respond to emotional blackmail. I’ve seen some online predators threaten suicide when they can’t get their own way. Don’t reply, at all. Treat it as if you didn’t even see the message. If you do reply, they’ll just twist what you say to suit their agenda. You have a RIGHT to be left alone, and you are not responsible for any emotional issues that may or may not create for other people. If you feel a threat is sufficiently serious, tell Twitter you’re going to contact the police, take their response into account, and then, if it’s still necessary, do it. Even if the police don’t feel an investigation is warranted they should be able to give you some advice based on your particular circumstance. I’ve now added a specific look at blocking etiquette in Twitter: When Should I Block?